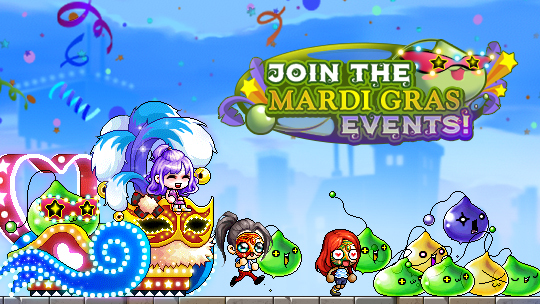 There is a Mardi Gras event for maplers according to MapleStory official site. Players can celebrate this event with bead necklaces and colorful masks and get yourself some great items from the Mardi Gras Box. Collecting beads is one of the best parts of Mardi Gras. Players Lv. 33 and above can begin the event by talking to NPC Gaga in the Event Hall. He'll send you out to hunt some monsters within your level range. Monsters are loaded with Mardi Gras Bead Necklaces, so keep hunting until you acquire ten of them. Return these to NPC Gaga to receive a Mardi Gras Box! Open the box to receive one random item such as restorative items, potions and buffs, Spell Traces, Potential scrolls, and more. See if you can get the colorful Parade Car Chair! This event can be repeated once every hour. After completed the Mardi Gras Throw event, you can speak to NPC Gaga to participate in the Margi Gras Masks event. Monsters within your level range are also dropping Mardi Gras Feathers! There are three different colors—green, purple, and red. Collect ten feathers of one color and return them to NPC Gaga to be rewarded with a Mardi Gras Mask! There are two masks for every color—a regular Mardi Gras Mask and a Royal Mardi Gras Mask. Both masks have a 30-day duration. In addition to a colorful mask, NPC Gaga will also give you a Mardi Gras Box! This event can be repeated once every hour, too. So keep picking up those feathers and try to collect all of the masks. These two events starts from February 1 and ends on February 28. Tired of grinding quests and events for mesos? Want to start merchanting but don't have the capital? If the answers is yes, then Maplestoryer is here to help! Here in our marketplace you can buy all the cheap MapleStory 2 Mesos you need.